Oct. 3 — Went to Dixmude to see the rear party. An Orchestra came down and played for a dance given by AGRA. I spent the night in the hospital with Hans Geggie. Oct. 4 — Drove him to Eecloo, arriving here just in time for lunch. Not awfully busy but by appearances, we are preparing for a big drive. The roads are filled with artillery and troops seem to be coming from all directions. This afternoon Brig. Fenwick paid us a visit. Tonight we had a picture show in the big school hall. The rest of the time, I have been working on a quarterly return. Oct. 5 — Brig. Farmer visited. We are all set up to look after the casualties for the big attack of the Scheldt. 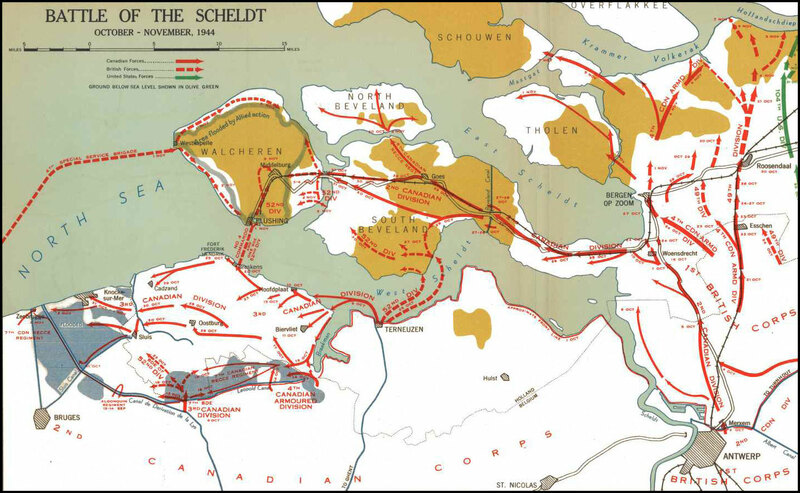 Battle of the Scheldt, October-November 1944. Oct. 7 — Still very busy. The 3rd and 4th Divs. 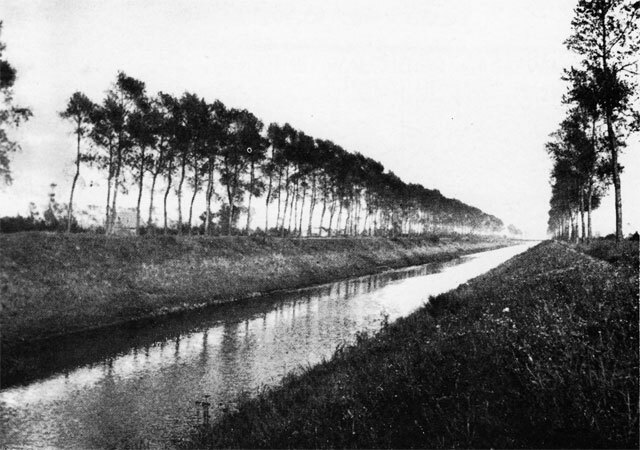 are having a very stiff fight at the Scheldt Estuary and we are covering their front. Four more Nursing Sisters arrived today. We were visited today by the DDMS of 21st Army Group. Oct. 8 – Sunday, six burials today. Still very busy. Russ Noble and old Dalrymple were down last night. They have made me a big present of a Jeep, which is certainly much appreciate. Doug Harkness called me today for a short visit. I am sending three Nursing Sisters and a Nun to Brussels tomorrow. Oct. 9 — Another busy day. Penny Watkins dropped in a for a visit today.